After Hours The coed group brings a contemporary sound to campus. 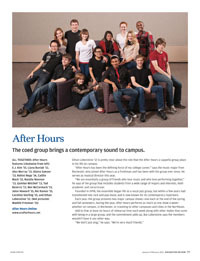 Ethan Lobenstine ’12 is pretty clear about the role that the After Hours a cappella group plays in his life on campus. “After Hours has been the defining force of my college career,” says the music major from Rochester, who joined After Hours as a freshman and has been with the group ever since. He serves as musical director this year. “We are essentially a group of friends who love music and who love performing together,” he says of the group that includes students from a wide range of majors and interests, both academic and cocurricular. 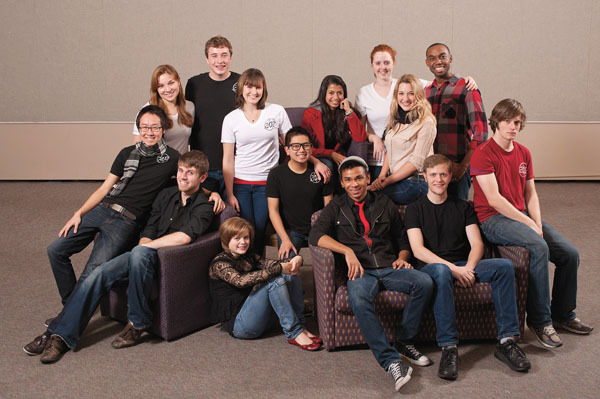 Founded in 1998, the ensemble began life as a vocal jazz group, but within a few years had transitioned into rock and pop music and is now known for its contemporary repertoire. Each year, the group presents two major campus shows—one each at the end of the spring and fall semesters. During the year, After Hours performs as much as one show a week—whether on campus, in Rochester, or traveling to other campuses and cities in the Northeast. Add to that at least six hours of rehearsal time each week along with other duties that come with being in a large group, and the commitment adds up. But Lobenstine says the members wouldn’t have it any other way.